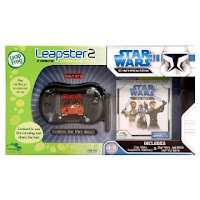 Amazon.com is offering the LeapFrog Leapster 2 Special Edition Star Wars Gift Pack for $35.19 shipped. The gaming system alone usually sells for $44.99, and the game included sells for $14.99. So this is a $25 dollar savings. This offer should sellout quickly, click here to take advantage of this deal and read reviews.